Unless you have been hibernating, you have heard about urbanization trends and have spent time reflecting on what this might hold for the future of communities, cities, nations, and the planet as a whole. The world’s total urban area is expected to triple between 2000 and 2030—urban populations are set to double to around 4.9 billion in the same period. On average, the rate of urbanization in the developing world will be five times that of the developed world. Depending on the estimate, the number of megacities (i.e., cities with populations over 10 million) is expected to double over the next decade. Most of the growth in megacities is expected to occur in resource-poor and highly fragile regions of the globe. Cities with over 10 million inhabitants are emerging in Asia, South America, and Africa. Presently, cities that are transitioning into megacities are far from resilient (seehere for my previous post on resilience). Many of them are highly fragile and unstable. When faced with crises and disruptions, whether they are due to natural, economic, or political factors, these environments are put under severe stress. They lack the capacity to respond to these stressors and often crumble under pressure. They also lack the ability to predict and plan for upcoming events. For example, Typhoon Haiyan struck the Philippines on November 8, 2013, resulting in untold devastation and the loss of 1,774 lives. Troops and aid agencies battled blocked roads, rubble, and debris to search for survivors. The Philippine government currently estimates that 2.5 million people are in need of food aid as a result of the crisis. Typhoons are extremely dangerous; this disaster could have been militated against by increasing the resiliency of coastal cities in the Philippines. Unfortunately, even when faced with “normal operating conditions,” the physical, economic, and political infrastructures and processes of our future megacities cannot adequately deal with the loads placed on them. Emerging megacities generally have large youth populations that are frustrated with the status-quo. Issues such as immigration and inequality in wealth and economic opportunities tend to fuel and prolong insecurity. We witnessed these dynamics playing out in the Middle East during the “Arab Spring” and today we get to see it live in Kiev, Ukraine. The World Health Organization (WHO) estimates that one billion people live in urban slums; 170 million people do not have access to bathroom facilities, and nearly 1.2 million people have died from air pollution in China. Such tenuous conditions in urbanized areas are met with more demands for public services and stronger governance. The McKinsey Global Institute estimates that by the year 2030, there will be 68 Indian cities of more than a million people, 13 with more than 4 million, and six megacities with populations of 10 million or more. More than 30 million people will live in Mumbai and 26 million in Delhi. This unprecedented growth directly effects development, growth, and support for public institutions. In India, inefficient governance systems and fragile infrastructure will be put under greater strain as a result of the impending population explosion.India’s bureaucratic system is the one of worst in the world. Excessive red tape, “fickle” regulations, and the willingness of India’s bureaucrats to accept bribes have a devastating impact on the efficiency and effectiveness of government. Transportation gridlocks, mass shortages of drinking water and food, burgeoning population that lives below the poverty line in slums, and the failure of public institutions are just some of the calamities that result from such conditions. Mumbai and Delhi are projected to need one trillion dollars in infrastructural improvements to effectively manage population growth. By 2015 there will be 33 megacities, 27 of which will be in the developing world, where the population explosion is challenging already fragile infrastructures. Megacities create record quantities of human waste and wastewater, adding to the strain on sanitation services. About two-fifths of the world’s population does not have access to adequate sanitation. Dhaka has a population of 15 million and is one of Asia’s fastest growing cities. 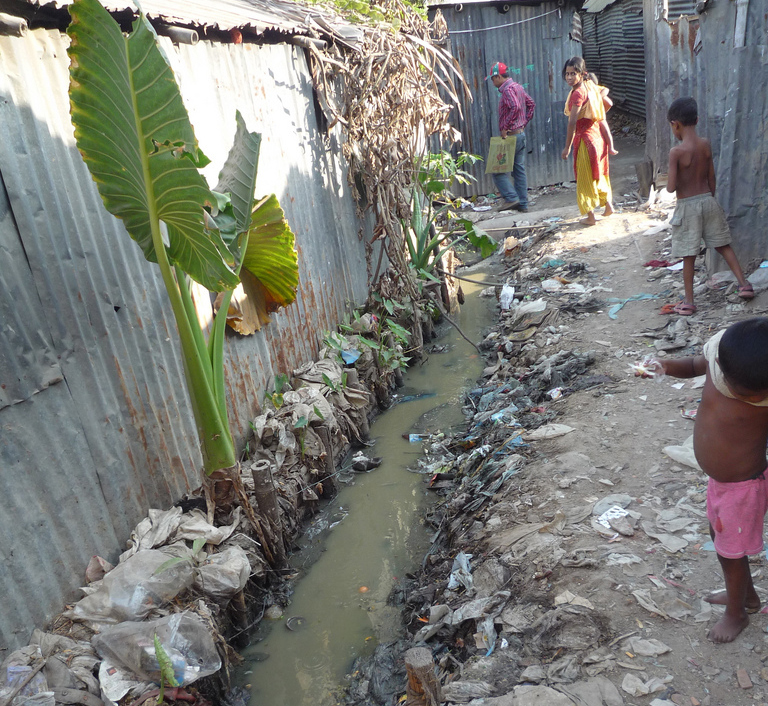 Nearly two-thirds of Dhaka's sewage is untreated and left to leak into waterways and the ground. Waste is dumped directly in waterways. The few public toilets that exist are neglected and extremely unhygienic. Unsurprisingly, tens of thousands Bangladeshi people die of cholera, diarrhea, dysentery, typhoid, and other waterborne diseases each year. We face a dire situation if we do not find ways to increase the capacity for resilience in our megacities. Our de-facto model is not sufficient—when a major crisis (e.g., earthquake, flood, political unrest, etc.) hits a megacity in the developing world, the developing world and NGOs respond by flooding it with personnel, supplies, and resources to deal with the aftermath. As soon as the immediate response and recovery is complete, the various organizations begin to exit. The local environment goes back to a state of fragility, and we wait for the next disaster, only to respond again, and again, and again. Not only is this model ineffective, it is also inefficient. Billions are spent to deal with an event in the near-term with limited investment and thought into making lasting interventions that either 1) lower the chances for the environment to face similar shocks going into the future or 2) increase the adaptive and resilience capacity of the local environment, people, processes, infrastructure, and governance systems to handle extreme events in the future. Regardless of whether you live in the developed or developing world, none of us are going to be to immune to the effects of extreme events that take place in one part of the globe. The planet is nondiscriminatory. We are all connected and interdependent, and our level of connectivity and interdependencies is intensifying. Cities in the developing world cannot afford expensive technologies. They do not have infrastructure at a level of maturity where traditional solutions make sense. Many cities lack basic infrastructure and resources necessary for basic survival needs and cannot invest the time, energy, or resources to purchase and implement glamorous technological solutions being sold. These innovations are not what these cities need. These cities need a sustainable capacity to develop innovations using their own internal resources and capabilities given their economic, political, and infrastructure realities. We need to build a resilience capacity from within these difficult environments—to this end we need to focus on frugal engineering and leveraging local knowledge. Frugal engineering is a new method of development that assesses the needs of the market as well as what the market can spend to respond to growing demands and tighter budgets. Through the “Reinventing the Toilet Challenge,” a grant program from the Bill and Melinda Gates Foundation, California Institute of Technology Professor Michael Hoffman and his team invented a solar-powered toilet that can safely dispose human waste for five cents a day. The toilet uses sun to power an electrochemical reactor that breaks human and water waste down into fertilizer and hydrogen, which is then stored in hydrogen fuel cells and used as energy. The toilet systems do not use septic systems or outside water sources, so once the water is treated, it is reused to flush the toilet or for irrigation. Other winners of the challenge invented toilets that produce biological charcoal, minerals, and clean water and other toilets that sanitize feces and urine. The utmost concern of frugal engineers is to meet the functional needs of the consumer. Robust products that can stand up to erratic supplies of electricity and harsh environments are needed. Mobile phone provider Nokia, for instance, knew that low-income agricultural workers were increasingly investing in cell phones. Researchers at Nokia noticed that phones were harder to use outdoors due to humidity and dust. Frugal engineers developed phones that could resist damage from dust and arid climates and removed “fancy” features from the phone—only phone calling and text messaging capabilities were included. These are good examples of frugal engineering. But we need more than frugal engineering. We need the ability to mobilize and leverage local knowledge to empower residents to build resilience solutions. A focus on indigenous knowledge is important for creating solutions that make sense within emerging economies. SABMiller produced just such an example by developing beer made from cassava and sorghum crops to market and sell in Africa. Through the use of locally-sourced materials, the company makes an affordable high-quality product for those who would otherwise be drinking informal or illicit alcohol. Indigenous knowledge is essential for survival among the rural poor. Indigenous knowledge evolves throughout communities and cultures as natives are forced to cope with the various stresses and challenges around them. Globalization and modernization brings with it many important developments but can also systematically silence indigenous knowledge. Frugal engineers in India had the need to construct affordable refrigerators that could withstand likely power outages in rural India and have a significant amount of portability for a very mobile population. India’s Godrej Appliances created a small, portable refrigerator called the ChotuKool. Significantly defeaturing a conventional refrigerator by removing unnecessary features, the ChotuKool has no compressor—instead it has a cooling chip and fan that can run on a battery to aid in power outages. In contrast to a normal sized refrigerator, the ChotuKool has 20 pieces instead of the 200 plus needed operate a conventional refrigerator and is priced at $55. Frugal engineers have to contend with infrastructure gaps that make traditional development of products and services challenging. Using leapfrog technology, engineers are adopting their technologies to unreliable or nonexistent infrastructure. For instance, the Indian mobile phone industry has managed to make mobile phones widely available despite limited, fixed-line infrastructure. India is the world’s second largest mobile market, with approximately 900 million mobile connections. Mobile broadband adoption in India is set to significantly expand over the next five years, from about 35 million mobile broadband connections to a potential 400 million mobile broadband connections by the end of 2017. Frugally engineered products have low variability and have a one-size fits all principle to keep costs down. When selling identical products, efficient service eco-systems are necessary to support the needs of consumers such as repair and financing. For instance, Selco produced simple, low-cost systems that combine solar panels and storage batteries. Selco’s lighting system has been installed in 100,000 homes in rural southern India and costs around 10,000 rupees ($200 USD). Because most rural Indians could not afford to pay for the systems upfront, Selco assembled an aggressive financing package with rural banks that provided financing to 85% of their customers. Additionally, service support personnel visited customers every three months during the first year to collect batteries for recycling and to check the systems functioning, creating a network that supports the product as well as the consumer. While the most successful cases of frugal innovation have happened in India, other countries are starting to make similar innovations. German technology company Siemens’ SMART (simple, maintenance-friendly, affordable, reliable, and timely-to-market) product portfolio aims to develop devices 40-60% cheaperthan the cost of the usual available devices in the market. Siemens developed a Fetal Heart Monitor that used a cheaper microphone technology instead of costly ultrasound technology. A Chinese company, Haier, introduced the Mini Magical Child, a washing machine alternative to large, expensive washing machines. In Kenya, millions of residents rely on M-PESA, a service that enables them to save, spend, and transfer money using their cell phones without having a bank account. Users learn how to use South Africa's Standard Bank on their mobile phone. Image by Mike Hutchings/Reuters. Crowdsourcing platforms bring together the concepts of frugal engineering and local knowledge. Using a creative approach to problem solving, Spatial Collective and Map Kibera—a company and a nonprofit, respectively—have begun to map Kenya’s mega-slum, Kibera. The problem both organizations are working to solve is the notoriously unreliable and inaccurate nature of maps in many areas of Africa. Maps are oftentimes obsolete and do not reflect recent changes. Additionally, common footpaths are not recognized on maps leading Africans to use informal landmarks such as bars or gas stations to navigate the landscape. That condition is worse in slums, where many areas are displayed as blank expanses on international maps such as Google Maps. Using a crowdsourcing approach, locals were invited to add landmarks such as schools, pharmacies, bars, and water taps to an open source map through the Internet, SMS messaging, or by attending community workshops. Spatial Collective then created maps using the crowdsourced information and official data. Map data has provided viable locations to build new public toilets, and community-reported crime data helped World Bank officials decide where to place street lamps for safety. With each problem solved, the maps are helping to make the Kibera safer and more livable for residents. To build a smart and resilient planet, we must focus on the challenges and opportunities in our future megacities. Frugal engineering is not charity; it should make sense in the market. Although frugal innovation assists the economically poor, innovations are made to be sold. Given the resource constraints associated with frugal innovations, a business model is necessary to succeed. Unless a viable business model exists the innovation will not be scalable or even sustainable in the long-run. The private sector has a critical role to play in ensuring that we build a capacity for resilience in our future megacities. As the examples above have shown, opportunities based on frugal innovation and tapping into local knowledge and expertise of the populous is crucial towards getting the private sector to contribute. Removing the wasteful or unnecessary aspects of products or services drives frugal innovations. Frugal innovations also create other important advancements for developing countries such as institutional and social advancements. When a frugal innovation is developed, value is not just created from that innovation; it is also adding value to society’s institutional and social standing. Consider the innovations created for the aforementioned “Reinventing the Toilet Challenge,” for instance. If taken to scale and deployed nationally and/or internationally, the most immediate impact would be the amount of adequate toilet facilities people would have access to. In addition to the most immediate value, other institutional value such as the country’s public health system, sanitation system and sustainability would all be affected by this new innovation. Socially, the value to society would include improved health outcomes, more opportunities for sustainability and more time not concerned with sanitation concerns to spend on personal and community needs. Ultimately, I believe that solutions generated by leveraging local knowledge in a manner that makes sense to the local context has a better chance of increasing resilience, economic vitality, and the quality of live in our fragile megacities than brute-force importing of solutions from the developed world. An important aspect of frugal innovation is that it doesn’t wait for markets to fit the particular model innovators have in mind; instead it adapts to the realities of society and the market. In a time when many large companies are shying away from entering emerging markets due to instability and corruption, frugal innovations that are developed with the local consumer in mind are helping to make developing countries more resilient. By not waiting for the optimum circumstances and working to serve the consumer directly with what’s available, frugal engineering is placing development in the forefront and creating new options for megacities to grow on.